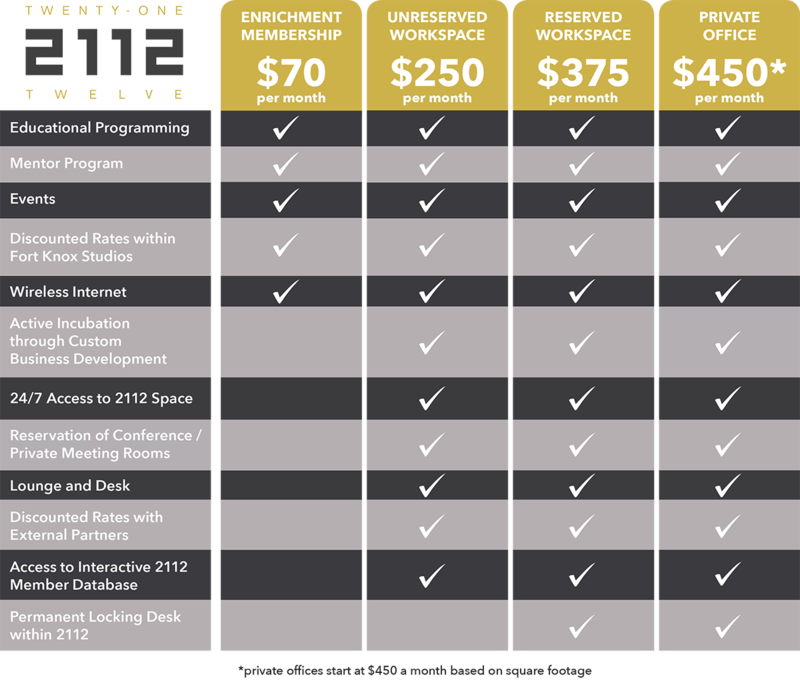 Members get access to educational programming, mentor programs, discounted rates within Fort Knox Studios and wireless internet. In an effort to further 2112’s established commitment to diversity, excellence and creating a more inclusive entrepreneurial creative sector, we’re proud to announce applications are now open for the 2112 Diversify Scholarship Program. Accepted startups will have the opportunity to receive up to $1500 towards the overall cost of 2112 membership dues. Additional Benefits: Tailored Educational and Professional Development Programming One-on-One Mentoring Networking Opportunities Women and minority-led startups in the creative sector are encouraged to apply by Thursday, February 28, 2019, 5 PM (CST).